Barack Obama apparently isn’t the only “rock star” in presidential politics this year. 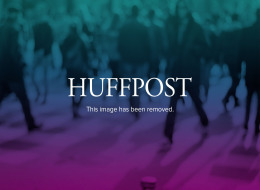 After days of intense media coverage about Republican vice presidential candidate Sarah Palin’s qualifications, more than 40 million Americans tuned in Wednesday to see for themselves what they thought of her. 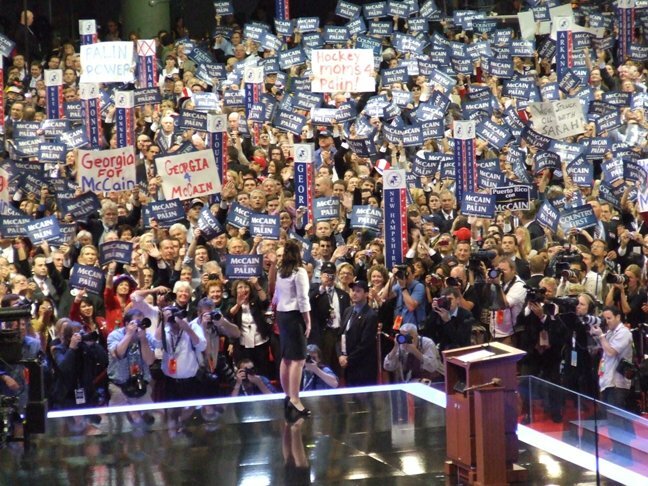 The huge audience for Palin’s acceptance speech rivaled that for Obama’s address at the Democratic National Convention six days earlier, and set a tough standard for the top of her own ticket. John McCain was to accept the GOP presidential nomination on Thursday. The first two days of the GOP convention essentially served as a build-up for Palin. The Alaska governor hadn’t spoken publicly since McCain selected her for the ticket last Friday, as a series of stories circulated questioning whether McCain had properly vetted her. Her poised speech, primarily going after Obama and touting McCain’s case for the presidency, was gushed over by many analysts. An audience of 37.2 million people watched Palin on ABC, CBS, NBC, CNN, Fox News Channel and MSNBC, Nielsen Media Research said Thursday. PBS estimated its audience at 3.9 million, based on a less reliable sample of several big cities. Nielsen does not count the audience for C-SPAN, which also showed the speech. Last week, Nielsen said 38.4 million people watched Obama speak at a Denver stadium on the six commercial networks, along with BET, TV One, Univision and Telemundo _ four networks that didn’t cover Palin’s speech. PBS added an estimated 4 million to that total. 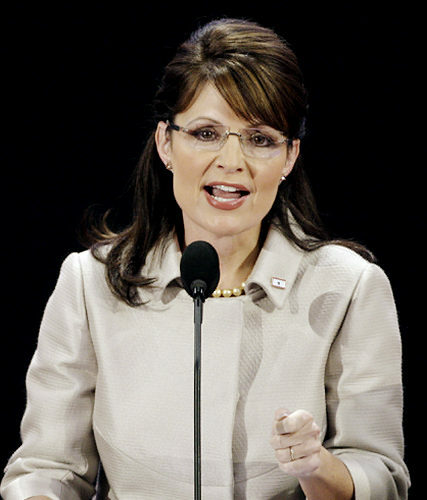 Nearly 2 million more women were watching Palin than men, Nielsen said. Viewers were far more interested in Palin than Democratic vice presidential candidate Joe Biden. Biden’s speech to Democrats last week was seen by an estimated 24 million people. The audiences for the Obama and Palin speeches were bigger than the ones this year for the Academy Awards, the finale of “American Idol” or the Olympics opening ceremony in Beijing. Fox News Channel led the way Wednesday, with 9.2 million people watching Palin’s speech on the cable channel. It was the third-largest audience in its history, behind only President Bush’s speech on Iraq in March 2003 and a Bush-Kerry presidential debate in 2004. NBC had 7.7 million viewers for Palin’s speech, followed in order by CNN, ABC, CBS and MSNBC, Nielsen said. Note that the 38.4 million figure for Obama included 4 networks on which Palin’s speech was not shown. In addition, the 37.2 million figure for Palin did not include her viewers on C-SPAN. If just the audiences on the 6 stations on which both speeches were shown were compared, most likely Palin’s audience would be the larger of the two. Also, if you consider that there was an audience of about 4 million each for Palin and Obama on PBS alone, adding her C-SPAN audience to Palin’s 37.2 million would likely bring her total audience to over 38.4 million. So Bauder’s statement that the audience for Palin’s RNC speech “rivaled” that for Obama’s DNC speech is very true.. Remember the cheers, the electricity in the air? What about the pride that radiated in the faces of her parents,Chuck and Sally Heath? Remember finding out after the fact that Palin’s teleprompter screen went black at which time she was forced to continue delivering that acceptance speech and did so without missing a beat? Following is the video of Governor Sarah Palin’s acceptance speech from 4 years ago. Watch it and you’ll fondly remember why you started supporting Sarah Palin and still do so today. This inspiring blog was posted at The Maritime Sentry one year after the announcement of Governor Palin as Senator McCain’s vice presidential running mate. I was asked to do a post on my reflections of Gov. Palin’s nomination for VP of the Republican Party. My wife and I actually started following Gov. Palin right after she was elected Governor of the state of Alaska. We joined the Draft Gov. Palin for VP movement over a year before she was actually picked. I truly believed that Gov. Palin could change the destructive course our Republic was on and bring common sense back to DC. Right before the nomination it was announced that Gov. Palin would not be the pick and that she was not even under consideration for the VP spot. It was pretty depressing because I was convinced she was the right person. The morning of the announcement I had woke up extra early to see if there had been a leak and Fox News was reporting that someone matching Gov. Palin’s description may have flown in. I excitedly ran and told my wife that it was Gov. Palin. For the first time in my life I understood what Democrats meant when they talk about the impact that JFK and RFK had on them. It was exciting to have a nominee that we had fought so hard for, but the greatest impact by far was how I felt as a father with daughters. I can’t describe it, but it felt like for the first time they could truly achieve anything, even the presidency if they so desired. For years I told my kids about Margaret Thatcher, but she was from my day. Now my kids would have someone from their lifetime to look up to. I belive Gov. Palin changed the nation even though she did not win the election. She changed it because she showed girls every where that they could be a conservative family woman, career woman, pro-Second Amendment, and pro-life and make it. This is what I will always be grateful to Gov. 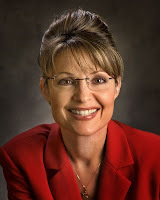 Palin for; the example that she is to my daughters and future generations of women yet to be born. So thank you Gov. Palin and I look forward with great anticipate to what the future may hold. on what a biased media unfairly put him through four years ago tonight. McCain. Thank you for everything. And happy birthday, my friend. Two of the three candidates endorsed by Governor Palin the Arizona primaries won their races yesterday. U.S. Rep. Jeff Flake handily won the Republican primary in the race to replace retiring Sen. Jon Kyl, setting up a general-election race with former U.S. Surgeon General Richard Carmona that is expected to be much more competitive. Flake, who has served six terms in the House, jumped out to a huge lead over businessman Wil Cardon, who spent millions of his own dollars trying to win the GOP nomination. Cardon, a political unknown, had flooded the radio and TV airwaves with his ads, but in pre-election polls, Flake always held commanding double-digit leads — a difference that showed up immediately in Tuesday’s vote counts. Flake will now face Carmona, who had no opponent in the primary. Some polls earlier in the summer indicated Carmona in a tight race with Flake and with a slight advantage in campaign funds headed into the general election. Flake, speaking from his home in Mesa on Tuesday night, said he believes he and Carmona offer such differing visions for Arizona that voters will find the choice easy to make. Republican U.S. Rep Paul Gosar has won the Republican primary in Congressional District 4, and is on his way to a probable second term in Congress. Gosar beat state Sen. Ron Gould, his closest rival, by a large margin as well as radio-station owner Rick Murphy in the Republican Primary. In the Democratic primary, political newcomers Johnnie Robinson of Florence and Mikel Weisser, a Golden Valley high school teacher, were virtually tied in early voting. District 4, however, is overwhelmingly Republican and if Gosar wins he is expected to have no difficulty winning a second-term in Congress. Gosar celebrated at a restaurant in Prescott with about 200 supporters. He said he was happy to have what he characterized as a “negative” primary campaign behind him and is now looking forward to the November general election. Former Congressman Matt Salmon has beaten former Arizona House Speaker Kirk Adams to win the Republican nomination for Arizona’s 5th Congressional District in southeastern Maricopa County. Salmon was leading Adams by 54 percent to 46 percent Tuesday evening. The Kirk Adams campaign released this video on the evening of the election. I suspect this is not the last we will hear from him as he seeks to serve his country. Wearing a lovely new updo, Governor Palin spoke with Megyn Kelly and Bret Baier of FOX news last night from what appeared to be outside her Arizona home. When asked by Megyn Kelly about the Tuesday speeches at the RNC convention, Governor Palin said that they met expectations and offered encouragement that the politicans giving them would walk the walk and not just talk the talk. She applauded Ann Romney for praising multi-tasking working Moms and being concerned about the futures of the children of middle class families. She said that Chris Christie “got to that point about our actual nominee, Mitt Romney, and his qualifications,” possibly reflecting the concern of many that Christie took so long to reach that point in his speech. Governor Palin deflected Bret Baier’s praise for her 2008 convention speech by saying the crowd was fired up in expectation of what Senator McCain would have to say the next night about restoring America’s greatness, especially after having heard what Obama had said about fundamentally transforming America. 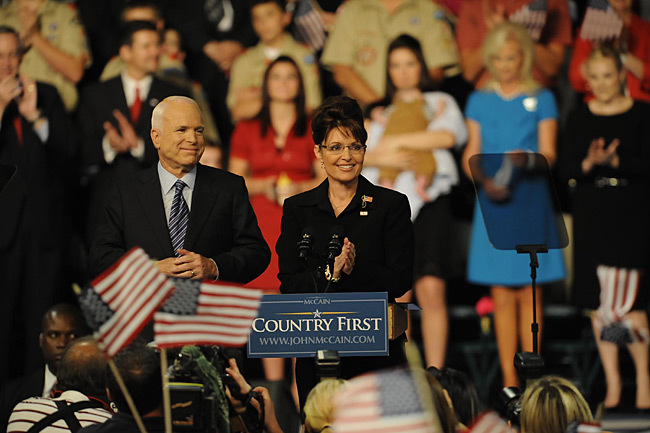 Four years ago today, Senator John McCain announced Alaska Governor Sarah Palin as his Vice Presidential running mate at a rally in Ohio. It just happened to be John McCain’s birthday and the Palins’ wedding anniversary. So today we want to celebrate the introduction of Governor Palin by Senator McCain to America and wish Senator McCain a happy birthday and the Palins a happy 24th anniversary. Wednesday marks an auspicious anniversary for Sarah Palin. The nation met her exactly four years ago: The date was Aug. 29, 2008 when then-White House hopeful Sen. John McCain introduced the inimitable governor of Alaska and her family at a campaign event in Ohio, telling the crowd of 15,000, “She’s not from these parts, and she’s not from Washington, but when you get to know her, you’re going to be as impressed as I am.” In a sleek black suit and signature up do, she was indeed a force to be reckoned with. “Principles matter more than the party line,” Mrs. Palin told her enthusiastic audience. Americans became transfixed by Mr. McCain’s audacious pick for a running mate. The mainstream press was outraged from the start. Illinois senator and presidential candidate Barack Obama phoned Mrs. Palin from his campaign bus to wish her luck. And four years later, she is still “not from Washington” — notably absent from the Republican National Convention, campaigning instead for select Republican candidates in Arizona. Mrs. Palin is not done yet, and has now taken convention officials to task for bandying about a new rule that would lessen the role of states in choosing delegates. Happy Birthday, Senator McCain! May you enjoy many more years of service to your country and happiness with your family. Happy Anniversary, Governor Palin and Todd! May you have many more happily married years and continue to be role models and leaders for our country.